So, who wants a sewing machine? 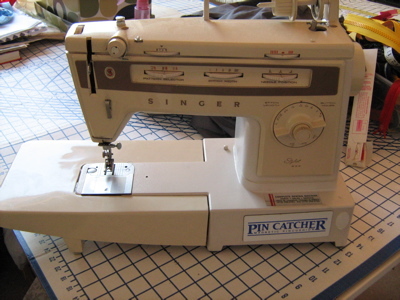 I'm giving one away … This Singer Stylist 834 was the first machine I bought for myself, with my own money (actually, with the first real paycheck I ever got!) … I'm trying not to be sentimental about this (because I really need to get rid of some STUFF) but I *would* like it to go to a good home. So instead of Freecycling or Craigslisting it, I thought I'd try here first. — the timing's off, so it needs a visit to the repair shop before you'll be able to use it. Luckily, the sticker on the machine will tell you where to go. Last time I took it in, the tuneup cost $80. — you have to be able to pick it up, here in Chicago … I won't ship it. This sucker's HEAVY. It does, however, have a carrying case. You have to pick it up before July 15 — I've given myself two weeks to give this away. — I think I have the manual. Somewhere. I'll try to dig it up. I also have some extra feet for it, but heaven only knows WHICH feet, and WHERE. They will also be the target of some sewing-room archaeology. I made a lot of clothes with this machine, and I think it's still good for a couple years' more sewing, if you don't do anything rough (like making jeans or canvas bags). It's simple to use (even without the manual) and friendly for beginners. If you want this machine, email me (the email address is over there, on the right, towards the bottom of this page) and we'll work out the details. In addition: I am selling my serger. (I really don't use it, and I'd rather use that space for more fabric or as a spot for the Singer Red-Eye machine, instead.) Serger status: sold. Also: does anyone do any crafting with circuit boards? I just came across a stash of old etherlink cards … if you want 'em, email me. Those are really light, so I'm happy to ship them. Now, like my innocence, circuit boards gone. I even love the faux dickey. Weirdly, I don't like real dickeys, but give me a faker version of an essentially fake thing, and I'm all over it. This one is from Jen at MOMSPatterns.com, and I would just like to taunt you all with the fact that when I was in Florida last week I MET JEN. And, as will surprise NO ONE, she is awesome. That is all. robots (okay, I haven't really met any robots on the street, but if I did, I would smile at them. Even if they had their lasers trained on me. What's your list? Is there anything you used to smile at but don't anymore? I used to smile at young people dressed in full traditional punk-rock garb, but then I realized that smiling at them in the "aw, you're so adorable with your safety pins and your black eyeliner!" way only pissed them off. So now I pretend to ignore them, and they're happy again. And they can't, they won't, and they don't stop … fauxlero! 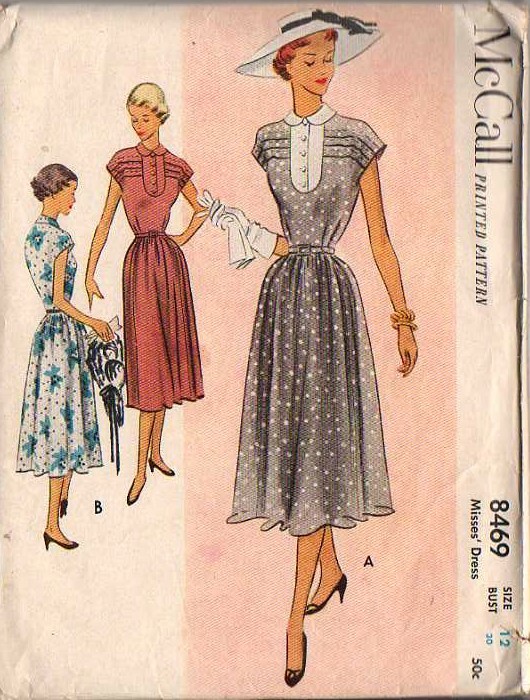 Julie from Sew-Retro Vintage Patterns just sent this to me, and I *wants* it. But it's not my size! (It's B38.) And, as we've already established, I'm way too lazy to grade patterns. Anyone got it in a B36? Sigh. I hope one of you B38 ladies buys it, makes it, sends me a picture, and wears it in good health to the next meeting of the Fauxlero Club. Here is the fourth in our continuing series of "Meet Our Advertisers": Penny from Antique Dollhouse of Patterns! 2000! My life was uncomplicated before 2000! 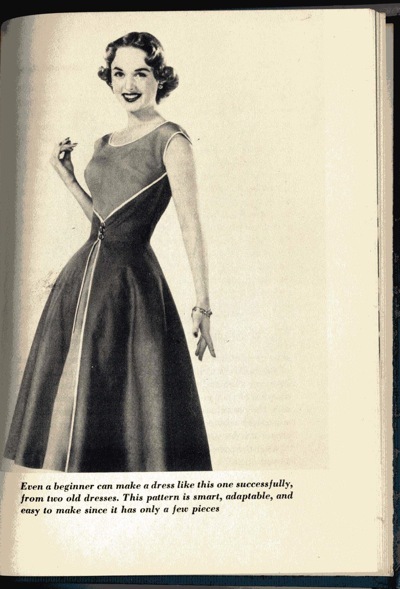 What motivated you to go into the vintage patterns (and dolls!) business? collectible. I was hooked and started collecting from that moment on. I was a secretary for the Government, for the Railways, and I volunteered with the Lions Clubs. Fort MacLeod, Southern Alberta, Canada, the first town in Alberta. My Marilyn Monroe and Elvis costume sewing patterns … doesn't everyone love Marilyn and Elvis? all under one roof … Now that would be organization! What do you enjoy most about working with patterns? parent daily in a nursing home at times. We count pattern pieces together, and many patterns trigger a memory. 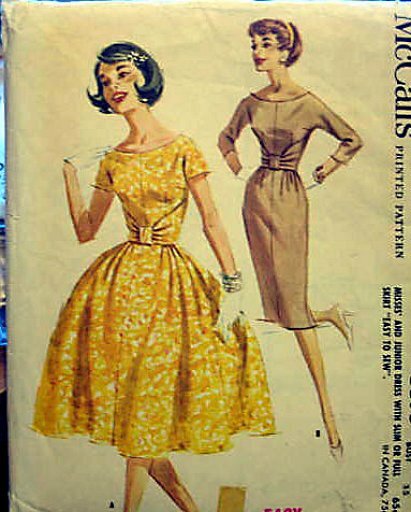 "Your aunt Nina made that outfit for you when you were three … This is the 1950 coat and hat set pattern … I wore that 1940s two piece peplum suit when I married your dad …" And on and on.. It passes the time while we are visiting. I am sure all mothers at one time sewed to survive. This is our link. I yell out the numbers or the letters and Mom ticks them off on the pattern sheet. And my world is fine when I see that wobbly OK on the back of the envelope. Marty North, Greenfield Park, Quebec, Canada, area near where I grew up in, and Chambly County High School, and Classmates.com, too. Erin you are the only blog I read about regarding fashion because you are the Fashion Queen!!! tealeaf readers (I am now retired). 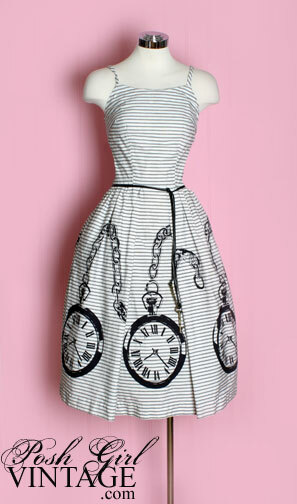 I am obsessed with this clock dress that Theresa sent me. It's already gone, of course, from Posh Girl Vintage … and it would have barely fit me anyway (and by "barely" I mean, I could have zipped it up, maybe, if I could renegotiate that whole "breathing" thing with my lungs). If one of you bought it, will you tell me that you love it, and that you wear it every (suitable) day, and that you have given it a special nickname? Please? The best part, of course, is that scrumptious clock print. I bet I could dig up the requisite clip art and Spoonflower myself some of that, don't you think? Should it be a big border print, like this one, or a smaller scatter print? Over red stripes, and or black and white as they are here? Interestingly enough, the clock here is set at roughly 8:23, and not 10:10, as fakey watches usually are now. Which means (at least according to Google Answers) that the print is really and truly old. Even a beginner can make a dress like this one successfully, from two old dresses. This pattern is smart, adaptable, and easy to make since it only has a few pieces. The online copies I've linked to above, on Amazon, are fairly pricey but my copy is marked "$1-" on the flyleaf and I'm sure I've seen this many a time in thrift stores and used book sales. Keep an eye out in those places, if you want it. 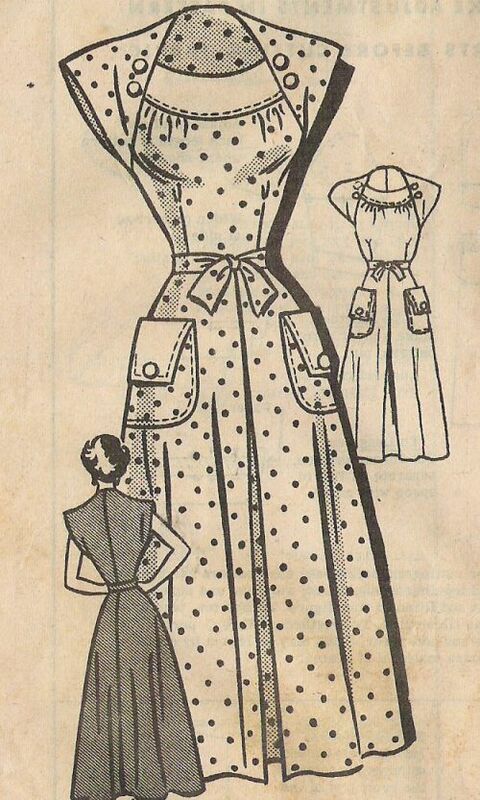 I still haven't made the Walk-Away dress, myself. I keep reading other people's reviews and can't decide whether to try it, and, if so, in what fabric … and, of course, where to put the pockets!